Welcome to a long overdue update on Conquest of the Gods. Some of you have been in touch asking when the game and the models will become available and if the game is still in development, the short answer is yes the game is in development. Life can, as they say – get in the way. Life was the reason for a lack of news or updates on the game. The short of it is that I have spent the last 3-4 years going through a divorce and custody battle so the time and money I would normally invest in the game had to be diverted elsewhere and to that end the game had to take a back seat to the needs of my kids. This year i renewed the domain hosting, business name etc. and I now have a new routine as a single dad, so it’s time to finally finish and post this overdue update! So what’s been happening with the game? I regularly get a Facebook message or email asking this, so I can advise that the miniatures range is all sculpted – 100% done. I might consider re-sculpting one, but that’s neither here or there, I have a full range of miniatures. The 3D prototyping and moulding is something that I’ll be revisiting as my budget allows. I need to re-establish these relationships and get the ball rolling again or look into bringing on a new resin caster. I have first casting runs of some of the core models here, but I want to change the casting process for at least one of the models and opt to cast one part in metal instead for durability. A couple of the infantry models need a minor scale adjustment before they go to final moulding. The last work in progress I shared was the Japanese giant miniature. After some head scratching the model has been broken down for moulding so that I could cast the rib cage with the negative space inside it as per the 3D renders. 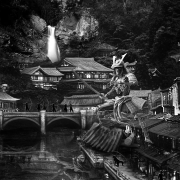 This models artwork has also been completed, keeping in theme with the black and white theme of all of the Japanese work in the book. 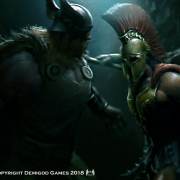 A centrefold illustration ‘Thor vs Ares’ that I’ll be using as a promotional image is also finished. This illustration depicts a moment in the books fiction that I wrote during the downtime, their encounter is an epilogue to the games core fiction. Speaking of the fiction I have drafted two new chapters in the fiction to fill a couple of plot holes that I didn’t see during the first draft of the fiction, one of these is a 200 word fight scene that was a personal challenge to write – imagine trying to write a Mortal Kombat style fight sequence in words! This was a fun artistic challenge that I hope others enjoy once I publish the book. The only thing left to do for the book is to finalise some renders for explanatory rules images and its is ready to hand to a printer (again when funding allows). Publication of the book is something I need to look at from a financial and logistical standpoint. I am keen to get peoples thoughts on digital publishing. The expected cost for an e-version of the book would be about $10US versus about $50 (a rough estimate) for a leather bound hardcover book. The dream was to print the leather hardcover book, but I’m also mindful of the need for more capital to do an initial print at minimum order quantities. All of the game accessories are all designed and ready for manufacturing. I’ll need to purchase a laser cutter for about two-thirds of the accessories and am going to purchase a smaller laser to get me started, with the hope of upgrading to something more commercial later on. Having explored the casting of the metal miniatures and components with 3rd party services here in Australia, and with overseas shipping factoring out overseas casters, I have concluded that it is simply too expensive to get someone else to cast the metal miniatures and components (unless I want to sell them at a loss). Capital for plant equipment to build my own casting forge is high on my list of things I need to resolve before I can greenlight selling the game and the miniatures to the general public. I have costed this and have a supplier ready to go once I have the cash to order it. 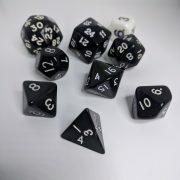 My dice manufacturer is ready to take orders, my dice set looks great and I’m ready to roll with this. I am weighing up if I should include the larger sized dice with the set or package them with the larger models that are not yet in the game. I am probably going to go with the latter as this will keep the costs of a dice set down. All of the paper accessories such as cards can be printed with the book. The intention was to have ‘model cards’ but I may revise this idea to something else. Having been playing a few games with model cards of late, I find them to be a pain to use during gameplay and having a printed sheet with what your using on it seems to be much easier (x-wing in particular). Packaging is one of the other final things to finalise but I have some good ideas that fit with the boutique style of my game. Most game start-ups probably would not cover the production challenges and economics in a blog like this but as it is fundamentally a personal project I figured I would share my thinking. So in sum I really just need to pull some capital together so I can purchase the casting plant equipment for miniature production plus some capital for a print run of the book, game cards etc. I could try raising this on Kickstarter, but I have a few concerns with that option so I am still weighing up how to take the final step of the journey to release. I am leaning towards selling the tokens I have designed for other games that I play with my gaming group, these are obviously games with a larger established fan base, selling these as a means to raise a little more capital might help nudge things towards the finish line with Conquest of the Gods. I have also drafted a sister sci-fi game (and the first expansion book) in the downtime, but that is the subject of another blog and probably isn’t worth announcing until I have the means to sell the content that’s already been created!